So Nokia's got a 10-incher with built-in 3G and A-GPS (Ovi Maps) in the works. 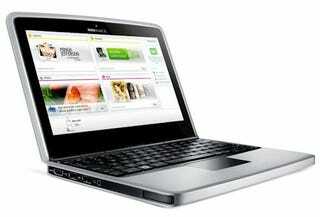 Interesting, but will it be just-another-netbook? I'd love to see a Nokia touch-screen interface on top of Windows. What about easy tethering with cell phones? Having some sort of tie-in with Nokia handsets (while not excluding everyone else) isn't a must, but it'd be nice, right? We'll have to wait and see. Here's what we do know: It'll be "HD ready" and have an Atom processor—hopefully that means Nvidia Ion-based. It will also have Wi-Fi, HDMI, and an SD Card reader. With a 12 hour battery and weight of 2.75 pounds, there's some massive potential here, if only on paper.